Play Synopsis: The Herdman’s were absolutely the worst kids in the history of the world. They lied and stole and smoked cigars (even the girls) and talked dirty and hit little kids and cussed their teachers and took the name of the Lord in vain and set fire to Fred Shoemaker’s old broken-down tool-house. 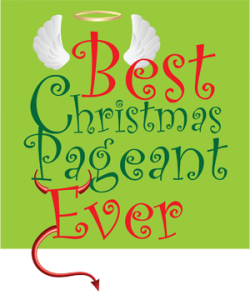 This year’s Christmas pageant has a brand new director. The wild and pushy Herdman’s head to church because of the donuts and stumble into the casting session for the pageant. Same-old Christmas pageant meets the enthusiastic, uninformed Herdman’s. A portion of proceeds will go to support Leukemia & Lymphoma Society and its mission to find a cure for blood cancers. Special Request from Director: PLEASE bring your schedule conflicts that you are aware of. Audition process: Auditions will consist of readings from the script – No monologue required. Sides for the audition process will be supplied at auditions. Audition form: Resumes and headshots will be accepted, but are not required. An audition form is required and will be available at the audition. Rehearsals will begin in third week of October in a second location then at the James Lee in November. Character/Role breakdown 20-30 can be in the cast depending on turnout and readings. 3 Teen girls (12-14ish): Alice (prim and prissy) Maxine, Doris. 3-4 Boys ages (8-12ish): Elmer Hopkins (Reverend’s son 11-14) Hobie. 3 -5 Girls ages (5-10ish): Beverly, Shirley, Juanita, baby angels, small girls. 1 person 40-55ish: Reverend Hopkins. 5 Mature women (35-60 plus) Mrs. Armstrong, Mrs. Slocum, Mrs.Clark, Mrs. Clausing, Mrs. McCarthy.